Being a charming compendium of historical delights and curiosities, in the form of a book of hours: the naming of stars, the dressing of Louis XIV, the waltz's 'fatal contagion', the sleep of flowers, cards with Casanova, and more. Entertaining, unexpected, and full of charm, the follow-up to Jessica Kerwin Jenkins’s Encyclopedia of the Exquisite presents a miscellany of engaging stories, detailing the intriguing customs, traditions, and guilty pleasures pursued throughout the ages. 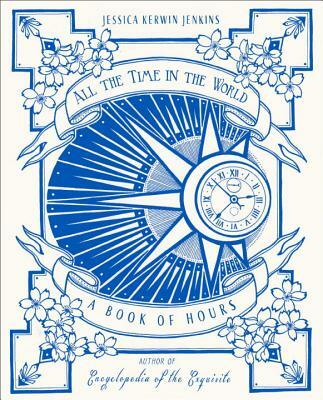 All the Time in the World takes its cue from an iconic component of medieval life, the book of hours, which prescribed certain readings and contemplations for certain parts of the day throughout the year. Divided into more than seventy-five entries, All the Time in the World is brimming with witty bons mots, interesting etymologies, and arresting anecdotes encompassing an array of cultures and eras. Subjects covered include the daylong ceremony of laying a royal Elizabethan tablecloth; the radicalization of sartorial chic in 1890s Paris; Nostradamus's belief in the aphrodisiac power of jam; the sensuous practice of sniffing incense in fifteenth-century Japan; the American fascination with flaming desserts; the short-lived artistic discipline of “lumia,” or visual music; the evolution of coffee from a religious ritual to a forbidden delight in the Middle East; Henriette d'Angeville's fearless and wine-fueled ascent of Mont Blanc; the elaborate treasure hunts concocted by London's Bright Young Things; and the musical revolution known as bebop. An antidote to the contemporary cult of “getting things done,” All the Time in the World revives forgotten treasures of the past while inspiring a passion for good living in the present. Jessica Kerwin Jenkins is the author of Encyclopedia of the Exquisite: An Anecdotal History of Elegant Delights. She began her career in New York, writing for Women’s Wear Daily and for W magazine, later becoming W’s European editor in Paris. She writes for Vogue and lives on the coast of Maine.